The Salone del Mobile in Milan is the place to be for product and furniture designers to present themselves internationally. The fair and all the surrounding presentations in the city attract many professionals from the international design world every year, in search of the latest developments in the field. The Creative Industries Fund NL calls on Dutch designers to submit a proposal for a presentation in Milan during the 'Salone del Mobile 2019'. This call is the only way to receive a grant from the Fund to participate in this event. This Open Call has ended. Find more information about the selected programs here. By issuing this call, the Fund aims to present the excellent quality of the Dutch design sector in Milan and to strengthen the international reputation of the Dutch creative industry. In addition, the purpose of the support is to share the knowledge and experience gained and to build and maintain relevant international relationships between parties. The Fund makes a selection of proposals where the presentation distinguishes itself in terms of artistic quality, presentation form and strategy. It is possible to apply for an individual presentation, but preference in this open call is given to proposals where special forms of collaboration are entered into or which focus on a group presentation. The proposal can be submitted until Wednesday 21 November at the latest via the online application environment of the Creative Industries Fund NL. 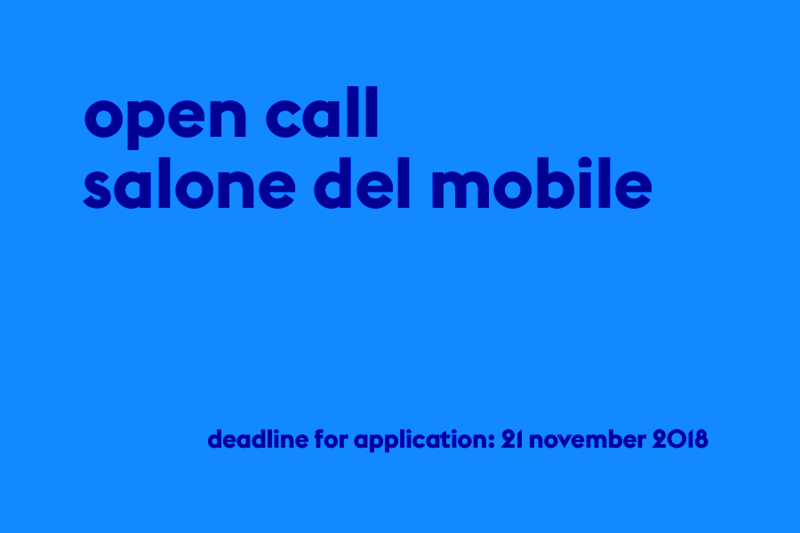 Select the grant programme 'Open Call' and then the 'Salone del Mobile 2019' round. 1.	a clear description of the objective and structure of the presentation. Include a description of the presentation location and motivate the choice for this location. A rationale for the presentation and an explanation of how the presentation fits into a long-term strategy of your own design practice. In the case of a joint or group presentation: motivate the collaboration and explain how the selection of participants took place or will take place; an explanation of the intended results and the significance for your own practice. 2.	a budget of costs and revenues (max. 1 page A4). The grant can only be used for the travel and accommodation costs of the designers involved, transport costs, costs for renting the location and for presentation/communication. These items must be clearly described in the budget and supported by, for example, quotations or reference amounts. The revenue budget reflects the personal contribution or support from external parties. For group presentations, a maximum amount of € 10,000 per proposal can be requested; for a presentation involving one or two designers/design studios, the limit is € 5,000 per proposal. Please note: Request your login details for the online application environment in good time and familiarize yourself with the application form. Validation of a new user account takes 1 working day at most. If the submission does not comply with the description above, the proposal cannot be evaluated. the extent to which the presentation contributes to the development of international practice and the broadening of the applicant's field of activity. the extent to which the selection of presentations contributes to strengthening the image of the Dutch creative industry abroad. The evaluation takes the form of a tender: this means that, within the available budget, a number of proposals are selected in preference to the others, with only the selected proposals being communicated about and not the rejection of individual proposals. A maximum amount of € 75,000 is available for this Open Call. The external advisers will be announced on this website as soon as possible. •	Applicants will receive an acknowledgement of receipt by e-mail no later than one week after the closing date. •	The selection of the proposals will be communicated by e-mail. The Fund aims to make its announcement by 15 December 2018 and will contact those selected. •	The procedure for an Open Call is described in the General Subsidy Regulations of the Creative Industries Fund NL. The grants are provided from the additional funds of the Ministry of Education, Culture and Science for Internationalization of exhibitions/presentations. If you have any questions about the open call and the procedure, please contact Eva Roolker or Roxanne Minten by e-mail or via telephone number 010-4361600. You may not present a concept of the proposal to the Fund office. Prior to and during the Milan fair week, the Fund will make every effort to publicize the selected presentations. The selected entrants are expected to submit images and text for this purpose in consultation with the Fund. After the selection, we will contact you about the conditions and deadline for providing material. The Fund may organize a meeting for those selected prior to the Salone del Mobile. The purpose of the meeting is to be as well prepared as possible as a selection to present the Dutch design sector in Milan. The selected people can get to know each other and exchange ideas and experiences for optimal participation. If your proposal is selected, your attendance at these meetings is expected. The Fund previously organized meetings concerning the Salone del Mobile. Read this item to take note of tips for an optimal presentation in Milan. For a look back at the Salone del Mobile 2017 click here and 2018 click here.